The hotel was very nice and the staff was very helpful in all of my requests. The fish in the lobby pond is a very interesting feature. The price of food in the restaurant was very high, especially breakfast buffet and the other items to purchase, were again very expensive. Over $5.00 for a large bottle of water. The fish and the helpful staff. Prices of food and extra items. nice place, would stay there again. Good staff, clean rooms, nice lobby, good option. Construction was taking place, not too bad, however. This was the best Omni I've ever stayed at. Loved the suite, enjoyed the staff, very attentive. Clean as a pin! The staff were so friendly! I cant think of anything! 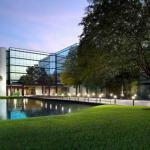 The pet-friendly Omni Houston Hotel Westside is surrounded by a picturesque two-acre lake and provides luxury accommodation for the upmarket business and pleasure traveler. Items included with the room rate at this 400-room hotel are high-speed Internet access, in-room coffee, a morning newspaper and self-parking. There are 25 meeting rooms available for business or social functions. The largest can accommodate 1,100 guests. The property is 16 miles from downtown Houston and a 35-minute ride from either the George Bush Intercontinental Airport or the William P. Hobby Airport. Other area landmarks and attractions include the Minute Maid Park, Toyota Center, the George R. Brown Convention Center, the Museum of Fine Art, the Houston Museum of Natural History and shopping at the Galleria Mall and the Katy Mills Mall. All the rooms have a work desk with high-speed Internet access, in-room refreshment center, two dual-line telephones with data port and voicemail, television with cable news and movies channels and Lodgenet system in-room movies, Nintendo game system, iron and ironing board, coffeemaker, alarm clock-radio, iron and ironing board, bathrobes and a hairdryer. Handicap accessible rooms and a variety of suites are also available. This hotel has an outdoor heated swimming pool, whirlpool and a fitness center. The 24-hour front desk has safe deposit boxes. Other amenities include a concierge desk, childrens entertainment program, laundry and dry cleaning services, ATM, gift shop and a business center. The on-site Café on the Lake is open from 6.30am until 10pm and serves afternoon tea daily and a special Sunday brunch. Poolside service and room service is available throughout the day. This Omni oozes luxury from check-in in the atrium-style lobby with its indoor stream to departure. The rooms are large, elegantly decorated and the beds are extra comfy. The professional team of workers provides top-notch service. Several guests said buying a package can be advantageous because of the extras that come with it, including a breakfast, special toiletries and even bottles of wine. This kind of quality does not come cheap  but if you want the best you must be prepared to pay the price. Parking: Yes, there is parking. There is no charge for self-parking. Valet parking costs $17 per day.